Members’ Meeting – save the date! We would like to warmly invite you to the 4th Members’ Meeting of the Textile Partnership at the GIZ Representation in Berlin on 30 October 2018. We shall send you information about registration and about the whole-day programme and procedure as soon as possible. We look forward to seeing you there. Six steps are necessary for setting up the procurement process for sustainable cotton – and the CottonUP Guide gives you a clear overview. To help you get to know the new, free information platform CottonUP better, an introductory webinar is being held on 9 and 11 October. Charlene Collison (Forum for the Future) and Jacqueline Vater (Made-by) from the Cotton 2040 Initiative will explain the central challenges involved in cotton production and the advantages of sustainable cotton. Thursday, 11 October 2018 from 4.30 – 5.30 p.m. The webinar will be held in English. You can register here. Dear Partnership members, we would like to invite you to the blockchain round table on 29 October from 11 a.m. to 6 p.m. The event will be held on the day before the Members’ Meeting in Berlin. The aim of the meeting is to get to know the blockchain technology better and to discuss together whether and to what extent blockchain could play a role in the textile delivery chain and the activities of the Textile Partnership. The workshop will be held in German and is aimed at all interested Partnership members. A detailed agenda will follow as soon as possible. You can register for the event via the members’ portal here up to 5 October 2018. Living wages will also be the key topic of an expert symposium that the civil society stakeholders of the Textile Partnership are planning to hold on 5 to 7 November in Berlin. Representatives from trade unions and NGOs from Germany and Europe, as well as from production countries in the textile industry, will discuss opportunities and challenges regarding the issue of wages in the textile industry. There will be guests from Bangladesh, Cambodia, India, Indonesia, Myanmar and Turkey, among other countries. Companies are explicitly invited to enter into dialogue with representatives of civil society in a workshop held on 6 November (2 – 5 p.m.). If you have any queries, please consult Tim Zahn (koordination@nro-textilbuendnis.de), coordinator for civil society organisations in the Textile Partnership. The Organic Cotton Round Table will be held from 10 a.m. – 4 p.m. on 8 November in Bonn. The objective of this meeting is to enable discussion of the challenges in the procurement of organic cotton and to define the relevant needs for joint involvement. 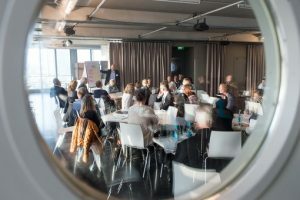 The workshop will be held in German and is aimed at companies that use organic cotton – even if only in extremely small quantities – and all other interested stakeholders. Please register for the event here by 12 October 2018. We would also like to invite you to the New Wool Round Table from 11 a.m. – 6 p.m. on 12 November in Eschborn, near Frankfurt am Main. The participants will be able to compare notes about the latest challenges in the procurement of sustainable new wool and to identify the relevant needs for joint involvement. The event will particularly focus on the traceability of certificates throughout the textile supply chain. Dalena White from the International Wool Textile Organisation will provide input on the related problems and approaches to finding solutions. The workshop will be held in English and is aimed at companies that use new sheep’s wool – even if only in extremely small quantities – and all other interested stakeholders. A detailed agenda will follow as soon as possible. Please register for the event here by 12 October 2018. A coaching session will take place on 13 November 2018 in Frankfurt am Main, which is designed to support companies in determining water risks and introducing holistic water management systems. The coaching session will give an introduction to materiality and water-risk analyses and will demonstrate how relevant information can be shared along the value chain. There will be a particular focus on the water stewardship approach. The coaching session will be organised by the German Global Compact Network (DGCN) and WWF Germany, in cooperation with the Textile Partnership. In contrast to the water coaching session in October, no previous knowledge of water management will be necessary for this event. Please register for this coaching session, which is subject to a charge, by 27 October 2018. You can find further information and the registration form here. Hendrik Plein at the Partnership Secretariat will be glad to help you with any queries.